Are you a teacher who needs a little help with Back to School shopping? This $200 Amazon gift card will help you start the year off right! 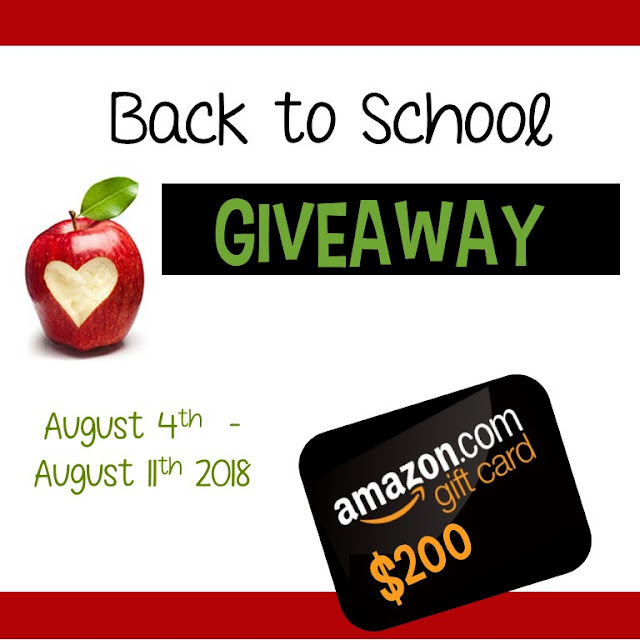 Two lucky teachers will each win a $200 Amazon Gift Card. Co-hosts: An Apple for the Teacher, Carla Hoff, The Craft of Teaching, Carrie Lutz, Think Grow Giggle, Planet Happy Smiles, Star Kids by Naomi, Sliding into 1st, It Happened in 3rd, MM Bilingual, Josie's Place, Glitter is Everywhere,Peas in a Pod Lessons, 180 Days of Reading, Mrs Hansens Helpfuls, Guide Teach Inspire, Digging Deep to Soar Beyond the Text, Right Down the Middle with Andrea, Roots and Wings, It's Kinder Time, Mrs Wenning's Classroom, It's a Teacher Thing, Ms. K, The Joy We Teach,The Chocolate Teacher, Alphabet Publishing Books, Katie Roltgen, TheBeezyTeacher, Teach Without Tears, The Best Days by Julie Santello, Momma with a Teaching Mission, Leah Popinski, Walk with Me a Second, Samson's Shoppe, Learning Inspired, A Plus Kids, Mickey's Place, Globe Trottin Kids, Bailey's Corner, and That Library Girl. Nice setup with really a classy look. Some time ago I was looking for such an event too, which will be in my budget and the one that is appreciated by all. During my search I found the New York venues and got fully satisfied and I am very much impressed by their settings and helping environment.